The Forrest Gump Challenge is an awesome CHIP TIMED race held in Branson, MO. The race is themed after the famous movie, Forrest Gump. Forrest Gump costumes are highly recommended! There will be awesome photo opportunities, Forrest Gump face cut outs, Forrest Gump bench, etc. 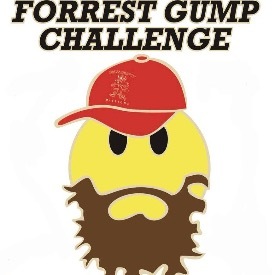 All finishers will receive one of our custom designed Forrest Gump themed medals! How does a virtual race work? Simply register for our race complete the distance any time and anywhere you desire (even on a treadmill!) by the race date. Who can participate? Anyone! Young or old, fast or slow – we encourage participants of all ability levels. Can I walk? Do I have to complete the entire distance all at once? We encourage you to run as much of it as you can, but walking is okay! Most participants complete their run all at once, but we understand that not everyone is able to complete a 5k or other distance in one outing. So set your goal – whatever that may be – and go out and accomplish it! If that means you need to break up your run into multiple segments, so be it. What if I can’t complete my run during the race period? It's okay, we understand that life happens. We still encourage you to complete the distance as soon as you can. We will mail medals to all virtul race registrants after the event date. How do I track my distance and time? The most accurate way to do this is by using a Running GPS watch, but there are also several free smartphone apps available for iPhones and Android phones that you can use. How big and how great are the medals? Big and really great. Our medals are at least 3″ in diameter and themed after Forrest Gump! When will I receive my medal? We will ship all medals the 2 weeks following the race date.